A cruise visit to Portland Maine is a wonderful way to spend the day. 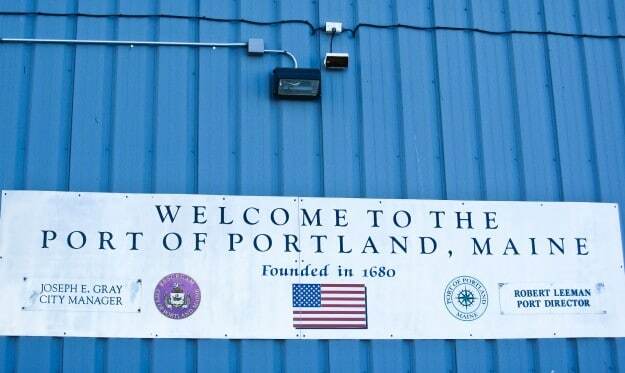 The port of Portland, Maine is in the heart of the city. Just walk off the ship and walk into town. Portland was the second port call on my late October Canada and New England cruise. Luck and weather were on our side. A bright blue mid-morning sky foretold of a beautiful, crisp fall day in the Northeast. Although the sun was shining as we entered Portland harbor, the temperature was hovering around forty-five degrees. With a bit of skillful layering of clothes, it was sure to be a perfect fall afternoon. If you’ve even been on a European river cruise, you know the convenience when your river ship docks in the heart of the city center. The Old Port in downtown Portland is the same; just steps away from entering the city. While cruise ships offer wonderfully scenic trips into the main countryside, not to mention a shopping trip to the L.L. Bean outlet, you might want to consider a leisurely day roaming around downtown Portland. My Portland walk-about led me all over the city. And with only one ship in port, there was no over-crowding issue at all! As you exit the secured port area, there is a guest information booth where you can pick up a self-guided walking tour map. As you walk along Commercial St. or Fore St, you’ll find wonderful little souvenir shops selling everything from nautical jewelry to handmade wool scarves and mittens. Restaurants abound, some catering to just locals and others garner the tourists. Explore the smaller side streets for even more local flavor. If you decide to take a short rest, head over to the The Maine Narrow Gauge Railroad Museum and go for a train ride. The Museum is located in the Old Port at the foot of Munjoy Hill in Portland’s East End. The scenic forty-minute journey aboard the antique train chugs along Portland’s working waterfront, showcasing spectacular views of Casco Bay. Getting back to food, my biggest decision for the day was where to sample the local lobster and chowder. A visit to Portland Maine without sampling fresh lobster and seafood would be a regret. I didn’t want to walk into one of the tourist diners. I was looking for the real deal. Somewhere off the beaten path, perhaps. So here’s what I did. When I’m looking for a non-touristy restaurant, I’ll ask a local. Rather than stop and ask random people on the street, I make a point of buying something at a small shop and then at check-out, ask for a suggestion for lunch. A wonderful second-hand shop in downtown Portland. Leaving Florida without a coat, I was in luck to find a beautiful DKNY full-length wool coat for $25! On this particular afternoon, a trendy designer consignment boutique beckoned. When my “new” DKNY full-length, wool-lined, all-weather coat was paid for and nicely wrapped (for a mere $26), I thought the timing was right to ask my usual eatery question. The sales woman directed me to Gilbert’s, a small hole-in-the-wall on Commercial St. just a couple of blocks from the port. Good location since we had an all-aboard time of 3:30. Even if I stayed late at Gilbert’s, I could make a quick dash to the ship without worrying about catching a taxi or tour bus. Although Commercial St. was swarming with our cruise ship’s guests, I took her advice. Gilbert’s looked like something out of a Norman Rockwell painting. As I suspected, everyone sounded like the Gorton’s fisherman and I knew I was in the right place. The lobster roll ($13.95) was piled high with off-the-boat-fresh, succulent Maine lobster. …accompanied by a bowl of seafood chowder! Gilbert’s home-made seafood chowder (a measly $4.50) was deliciously overloaded with shrimp, scallops, white fish and still more lobster. While I enjoyed my counter-lunch I struck up a conversation with a couple of the customers and the counter-waiter. I spent an hour listening to local banter and shared my cruise itinerary when asked where I was headed to next. Most were in disbelief that we were headed to Quebec City. With snow predicted for the next two days, surely there would be snow across the deck when we docked there. I intended to send my new coat to the ship’s laundry for cleaning as soon as I was back on board. It would be sorely needed with snow and sleet ahead. A quick glance at the old school-house clock on the wall behind the counter, reminded me that it was time to leave. Everyone bade me a bon voyage, I waved good-bye and in ten minutes I was back on the ship. Just in time for a late afternoon sailaway and an invitation to experience it from the helipad. Hot chocolate and champagne all around! It was a beautiful, fall afternoon to sail away from Portland with a panoramic view from the helipad. Tomorrow would be Halifax and another day of walking up and down through the harbor area. Hopefully, as in Portland, there will be more vibrant fall foliage. The photo above was taken three days after leaving Portland Maine. Sure enough, we were treated to snow, sleet and wind. It was so unique and so much fun especially for the crew, many of whom had never seen snow. If a Canada/New England cruise is on your to-do list, find one that includes a stop in Portland, Maine. Don’t feel compelled to sign up for a shore excursion. Simply exit the Old Port and leisurely stroll through the downtown area. Sample a “real” New England seafood lunch. Shop for unique “Made in Maine” handicrafts and hand-knit woolens. If you’d prefer a cold weather experience to fall foliage, choose one of the last sailings of the year. Maybe you’ll get lucky too and experience a snowy cruise. View of Portland harbor as we headed towards the Gulf of St. Lawrence and into the St. Lawrence River. Portland, Maine, one of the nicest American ports of call; friendly, accessible and delicious. My daughter and I flew to Portland from Tn in late October 2016. We only had 4 days to enjoy the beauty of Maine but loved every min of our trip and planning to go back as soon as we can but hope to have at least 7 days next time. We didn’t waste one min of our trip. Within an hour of landing in Portland we were on the trolley trip around town,thought it would be the best way to get out bearings of the area. Trolley ride also included a trip to the main lighthouse there also. After our tour we had our first lobster roll at The lobster co. On commerce st ,sorry to say it was a disappointment! Our weather was not perfect it was foggy and light rain for the first 2 days but we still loved every min of it and we’re able to do every thing that was on our list. Second day we took the ferry over to Peaks island (after a visit to Holy donut,which is a must! )rented a golf cart and toured the island. We talked to one of the islands residents and received tons of valuable info on do’s and dont’s . Great time ! Decided to go the the little creape place we noticed on the trolley ride and had a delicious lunch. Can’t remember the name but located across the street from cemetery dated back to the 1700’s which we toured also. Decided to go shopping in Freeport again (did that the night before also) this time we found such great deals we just couldn’t resist, we only brought Carry on bags so this was going to be a problem. Back in Portland we did more sight seeing , drove to Cape Elizabeth to see and photograph another light house but the fog was too heavy to see the lighthouse but we loved the crashing waves around that area. Stopped at several neat little shops then back to Commerce st to shop there. Our 2nd full day started with a stop at—-yep, Holy donut for our road trip up rt 1 to Bar Harbor. Along the way we stopped at a goodwill to shop for a suitcase for all of our super deals in Freeport. The scenic rt to Bar Harbor is beyond beautiful ! We stopped often to take photos . One place we want to tour next trip is Camden, oh my it was beautiful! In Bar Harbor we stayed at the BH spa and resort,will pat myself on the back for booking there. Our beautiful room was facing the beautiful harbor with all the lobster boats. Still misty and chilly but didn’t stop us. Great dinner at Geddys and enjoyed all the cute little shops downtown,also drove around sightseeing. Our last morning in Maine we woke up to the most beautiful day ever,walking out on our little porch was taken back with how beautiful every thing was. We only had a few hours before we had to start back to Portland for our flight home so we wanted every min to count. We just couldn’t leave without seeing a little bit of Acadia state park so after asking around we found out the best rt and off we go. Beautiful just isn’t enough to describe what we were in for..back in Portland we had an extra hour before checking in at the airport so decided to drive back to check out the lighthouse at Cape Eliz that we couldn’t see on the foggy day,was not disappointed after all this was a perfect day! Will have to say when the Lord created heaven and earth he spent a little extra time on the state of Maine! We are back in Tn ,which we think is beautiful also,but longing to visit Maine as soon as we can but a much longer visit this time. This was a mom and daughter trip but may let the hubbys go next time.there was a lot of details left out but tried to hit a lot of the high lights . Thanks for taking the time to read and comment. Portland is fun city and so accessible when you arrive via cruise ship. You are right; Portland is definitely worth your time to explore. We were there a couple of years ago and, as a fellow foodie, you will appreciate that we took time for a Maine Foodie Tour and it was a great introduction to the city.